The Ebac CD100E dehumidifier is a high capacity, heavy duty dehumidifier designed for industrial and commercial applications. It can operate as a free-standing unit and is suitable for movement from site to site if required. Alternatively this unit can be permanently installed in any location and ducted to make maximum use of its power. Designed to dehumidify large areas and optimized for low temperature operation this unit is ideal for tough jobs in harsh conditions. The Ebac CD100E dehumidifier is a powerful unit capable of removing 97 pints of water from the air at the Association of Home Appliance Manufacturers (AHAM) standard test conditions of 80°F and 60% relative humidity. In the more extreme conditions often found in industrial and commercial applications this dehumidifier can remove up to 21 gallons of water in 24 hours. This impressive capacity enables the CD100E to handle large areas up to a maximum of 3000 sq ft (manufacturer's recommendation) and it has been successfully used in a range of locations including warehouses and store rooms, electrical and communications switching stations, locker rooms, basements and pumping stations in addition to marine applications such as offshore oil rigs and ships, both active and laid up. Some of these locations present demanding challenges to any dehumidifier including low ambient temperatures, moving platforms and rough handling, not to mention long periods of unattended operation. The Ebac CD100E is well prepared to deal with any and all of these conditions. The unit's internal components are robust, high quality and effective, including a "floating" compressor to protect the unit from the effects of vibration, movement and during transit. The heavy duty mechanisms are mounted on a sturdy chassis and robust casing both constructed from steel and with an epoxy powdered coating for additional protection from impacts and abrasions. The sum of all these parts is a durable and reliable unit as tough as the conditions in which it works and entirely dependable. To ensure maximum performance even at very low ambient temperatures the CD100E incorporates a hot gas defrost feature of Ebac design. This system detects and actively melts ice forming on the refrigeration coils and allows this unit to perform effectively at temperatures as low as 33°F. At such low temperatures even a space that feels relatively dry may have a high relative humidity with a risk of condensation and consequent water related damage. The Ebac CD100E is a neatly designed cube with compact dimensions, for a unit of its power, of 36 x 20 x 16 inches. This is an advantage where space is tight and also makes it relatively simple to operate the unit from a wall-mounted position if this is more convenient. 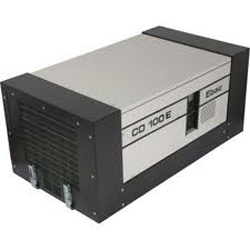 The CD100E offers further flexibility in installation as it can operate effectively as a stand-alone unit or be permanently emplaced by means of a ducted installation. The stand-alone option also permits this unit to be transferred between sites as required and it small dimensions and robust design make this a simple operation. The Ebac CD100E includes an adjustable humidistat enabling the preferred level of relative humidity to be set and maintained automatically. This is particularly advantageous where the unit will be unattended for long periods and in all locations it saves energy by preventing the unit running continuously when the humidity level is at or below the pre-set level. Equally important for unattended operation is the CD100E's capacity for continuous drainage. This operates by means of a gravity feed and requires a nearby drain at the same level as the unit. If this is not convenient a separate condensate pump will be required for longer horizontal distances or to raise the water to a higher level drain. For the convenience of commercial operators the CD100E also includes an hours run meter.